The Edmonton Metropolitan Region (EMR), also commonly referred to as the Alberta Capital Region, Greater Edmonton or Metro Edmonton, is a conglomeration of municipalities centred on Alberta's provincial capital of Edmonton. The EMR's commonly known boundaries are coincident with those of the Edmonton census metropolitan area (CMA) as delineated by Statistics Canada. However, its boundaries are defined differently for Edmonton Metropolitan Region Board administrative purposes. The EMR is considered a major gateway to northern Alberta and the Canadian North, particularly for many companies, including airlines and oil/natural gas exploration. Located within central Alberta and at the northern end of the Calgary–Edmonton Corridor, the EMR is the northernmost metropolitan area in Canada. four Indian reserves for three First Nations (Alexander 134 of the Alexander First Nation, Stony Plain 135 of the Enoch Cree Nation, and Wabamun 133A and 133B of the Paul First Nation). The Edmonton CMA is the largest CMA in Canada by area at 9,426.73 km2 (3,639.68 sq mi). In the 2016 Census, it had a population of 1,321,426, making it the sixth largest CMA in Canada by population. The Edmonton CMA comprises the majority of Statistics Canada's Division No. 11 in Alberta. A fragmentation in regional cooperation and partnership has long played a divisive role within the EMR. Particularly, Edmonton was frustrated that its surrounding municipalities were receiving an increased tax base for major industrial development, while not contributing to Edmonton's burden to maintain and build new infrastructure within Edmonton used by the residents and businesses of the surrounding municipalities. After pulling out of the Alberta Capital Region Alliance (ACRA), Edmonton lobbied the provincial government to establish some form of regional government that would be more effective in fostering regional cooperation between it and its surrounding municipalities. As a result, Premier Ed Stelmach announced in December 2007 that a governing board would be established for Edmonton's Capital Region. Four months later, the Capital Region Board was formed on April 15, 2008 with the passing of the Capital Region Board Regulation by Order in Council 127/2008 under the authority of the Municipal Government Act. On October 26, 2017, the Capital Region Board (CRB) was renamed to the Edmonton Metropolitan Region Board (EMRB). The CRB was originally established with 25 participating or member municipalities – 23 of which were within the Edmonton CMA and two of which were outside the CMA (Lamont County and the Town of Lamont). The number of member municipalities was reduced to 24 on September 10, 2010 after the Village of New Sarepta dissolved to hamlet status under the jurisdiction of Leduc County on September 1, 2010. Concurrent with the CRB's name change to the EMRB in October 2017, municipal membership decreased from 24 to 13 to include only those municipalities with a population of 5,000 or more. three towns (Devon, Morinville, and Stony Plain). Under the CRB Regulation, the CRB was tasked with preparing a growth plan to cover land use, intermunicipal transit, housing, and geographic information services components. In March, 2010, Growing Forward: The Capital Region Growth Plan (CRGP), consisting of individual plans for these four components and two addenda, was approved by the Government of Alberta. The CRGP includes a population and employment forecast for the Capital Region. With a base population of 1.12 million in 2009, the CRB has forecasted the population of the Capital Region to reach 1.31 million by 2019. However, the 2019 population estimate was reached and exceeded by 2014. The CRGP also designates priority growth areas and cluster country residential areas within the Capital Region. The following is a list of municipalities in the Edmonton CMA, with those that are members of the EMRB indicated accordingly. ^ Strathcona County's 2016 federal census population of 98,044 includes 70,618 in the Sherwood Park urban service area. ^ The combined Wabamun 133A and 133B population of 1,622 includes 1,592 in Wabamun 133A and 30 in Wabamun 133B. Major industrial areas within the ECR include the northwest, southeast and Clover Bar industrial areas in Edmonton, Nisku Industrial Business Park in Leduc County, Acheson Industrial Area in Parkland County, Refinery Row in Strathcona County, and Alberta's Industrial Heartland spanning portions of Sturgeon County, Strathcona County, Lamont County and Fort Saskatchewan. At the moment, two more major industrial areas are in the final stages of establishment. The establishment of the Horse Hills industrial area in northeast Edmonton is in the final planning stages, while Edmonton Airports is currently planning its inland port development under the Port Alberta initiative at the Edmonton International Airport within Leduc County. ^ a b "Population and dwelling counts, for Canada, provinces and territories, and designated places, 2016 and 2011 censuses – 100% data". Statistics Canada. Government of Canada. Retrieved 14 February 2017. ^ a b "Fact Sheet: Geographic Profile" (PDF). Capital Region Board. Archived from the original (PDF) on 2013-03-25. Retrieved 2012-02-13. ^ "Census Profile – Geographic hierarchy: Edmonton (Census metropolitan area)". Statistics Canada. 2012-02-08. Retrieved May 28, 2016. ^ "Population and dwelling counts, for census metropolitan areas, 2011 and 2006 censuses". Statistics Canada. 2012-02-08. Retrieved 2012-02-13. ^ Canada, Government of Canada, Statistics. "Census Profile, 2016 Census - Edmonton [Census metropolitan area], Alberta and Canada [Country]". www12.statcan.gc.ca. Retrieved 2018-08-30. ^ Archie McLean & Susan Ruttan (2007-12-19). "Mayor "elated" by new regional planning board". Edmonton Journal. Archived from the original on 2012-11-03. Retrieved 2008-01-09. ^ "Order in Council 127/2008". Alberta Queen's Printer. April 15, 2008. Retrieved December 24, 2009. ^ "Order in Council 355/2017". Alberta Queen's Printer. October 26, 2017. Retrieved November 18, 2017. ^ Simons, Paula (November 1, 2017). "Welcome, neighbours, to the Edmonton Metropolitan Region". Edmonton Journal. Retrieved November 13, 2017. ^ "Order in Council (O.C.) 66/2010". Province of Alberta. 2010-03-15. Retrieved 2012-02-13. ^ "Order in Council (O.C.) 316/2010". Province of Alberta. 2010-03-15. Retrieved 2012-02-13. ^ "Order in Council (O.C.) 230/2010". Alberta Queen's Printer. Retrieved 2010-07-15. ^ a b c "New faces for a newly revitalized region". Edmonton Metropolitan Region Board. October 28, 2017. Retrieved November 13, 2017. ^ "Capital Region Board". Capital Region Board. Retrieved 2012-01-21. ^ "Capital Region Growth Plan: Growing Forward". Capital Region Board. Retrieved 2012-01-21. ^ "The Capital Region Growth Plan Addendum" (PDF). Capital Region Board. December 2009. Retrieved 2012-01-21. ^ "Population of census metropolitan areas". Statcan.gc.ca. 2017-03-08. Retrieved 2017-04-30. ^ "The Capital Region Growth Plan Addendum" (PDF). Capital Region Board. October 2009. Retrieved 2012-01-21. ^ "2010 Municipal Codes" (PDF). Alberta Municipal Affairs. 2010-04-01. Retrieved 2010-09-03. ^ a b "Focus on Geography Series, 2016 Census - Census metropolitan area of Edmonton". Statistics Canada. April 23, 2017. Retrieved November 18, 2017. ^ a b "2016 Municipal Affairs Population List" (PDF). Alberta Municipal Affairs. ISBN 978-1-4601-3127-5. Retrieved November 19, 2017. ^ "2017 Municipal Census Population Results". Town of Beaumont. June 27, 2017. p. 161. Retrieved June 29, 2017. ^ "Fort Saskatchewan population continues to grow". City of Fort Saskatchewan. June 6, 2017. Retrieved June 6, 2017. ^ "City of Leduc population surpasses 31,000 according to 2017 census". City of Leduc. June 28, 2017. Retrieved June 29, 2017. ^ "Municipal Census - 2017 Demographic Report". City of Spruce Grove. August 14, 2017. Retrieved November 19, 2017. ^ "Census". Strathcona County. August 23, 2015. Retrieved November 18, 2017. Beaumont () is a city in Leduc County within the Edmonton Metropolitan Region of Alberta, Canada. It is located at the intersection of Highway 625 and Highway 814, adjacent to the City of Edmonton and 6.0 kilometres (3.7 mi) northeast of the City of Leduc. The Nisku Industrial Park and the Edmonton International Airport are located 4.0 kilometres (2.5 mi) to the west and 8.0 kilometres (5.0 mi) to the southwest respectively. Originally a French farming community, Beaumont is now a city with 18,320 people. Its downtown core resembles a French village with unique architecture and red brick walkways. It is named for the "beautiful hill" on which St. Vital Church, built in 1919, is located within the centre of the city. The name was selected in 1895 as part of a petition for a post office. Bon Accord is a town in central Alberta, Canada. It is located 40 km (25 mi) north of downtown Edmonton on Highway 28. The name is derived from "Bon Accord", the ancient motto of Aberdeen, Scotland, the ancestral home of a first settler.The International Dark-Sky Association designated Bon Accord an International Dark Sky Community in August 2015 in recognition of the town's implementation of initiatives to preserve and enhance dark night skies over the community. It was the first community in Canada and eleventh in the world to earn this designation. Bruderheim is a town in the Edmonton Capital Region of Alberta, Canada. It is located just north of the junction of Highway 15 and Highway 45, approximately 47 km (29 mi) northeast of Edmonton. The town's name is derived from two German words: "Bruder" meaning brother and the suffix "-heim" meaning home. In English, it translates to "Home of the Brother". Devon is a town in the province of Alberta, Canada, situated 26 kilometres (16 mi) southwest of Edmonton, the provincial capital, and located along the banks of the North Saskatchewan River. Lakeview is a summer village in central Alberta located on Wabamun Lake. It is located within Parkland County. Leduc is a city in the province of Alberta, Canada. It is 33 kilometres (21 mi) south of the provincial capital of Edmonton and is part of the Edmonton Metropolitan Region. Legal is a town in central Alberta, Canada within Sturgeon County. It is located 2.4 km (1.5 mi) east of Highway 2 on Highway 651, approximately 42 km (26 mi) north of Edmonton. Legal was established in 1894 as a Francophone community. The town, the French Mural Capital of Canada, is known for its 28 murals. Communities in parentheses () indicates the airport is not in a community. A city is the highest form of all incorporated urban municipality statuses used in the Canadian Province of Alberta. Alberta cities are created when communities with populations of at least 10,000 people, where a majority of their buildings are on parcels of land smaller than 1,850 m², apply to Alberta Municipal Affairs for city status under the authority of the Municipal Government Act. Applications for city status are approved via orders in council made by the Lieutenant Governor in Council under recommendation from the Minister of Municipal Affairs.Alberta has 19 cities that had a cumulative population of 2,837,511 (not including the population in the Saskatchewan portion of Lloydminster) and an average population of 149,343 in the 2016 Canadian Census. Alberta's largest and smallest cities are Calgary and Wetaskiwin, with populations of 1,239,220 and 12,655, respectively.Beaumont became Alberta's 19th city on January 1, 2019.157 elected city officials (19 mayors and 138 councillors) provide city governance throughout the province.The highest density of cities in Alberta is found in the Edmonton Metropolitan Region (Beaumont, Edmonton, Fort Saskatchewan, Leduc, Spruce Grove and St. Albert). The Calgary Metropolitan Region has three cities (Airdrie, Calgary` and Chestermere). Morinville is a town located within the Edmonton Metropolitan Region. It is located approximately 34.3 kilometres (21.3 mi) north of the City of Edmonton along Highway 2. Spring Lake, originally named Edmonton Beach, is a village in central Alberta, Canada. It is located on the eastern shore of Spring Lake, approximately 20 km (12 mi) and 40 km (25 mi) west of the cities of Spruce Grove and Edmonton respectively. Hasse Lake is located 6 km (3.7 mi) southwest of Spring Lake. It was known as the Summer Village of Edmonton Beach from 1959 to 1999. Spruce Grove is a city that is 11 km (6.8 mi) west of Edmonton, Alberta in Canada. The city is adjacent to the Town of Stony Plain and is surrounded by Parkland County. 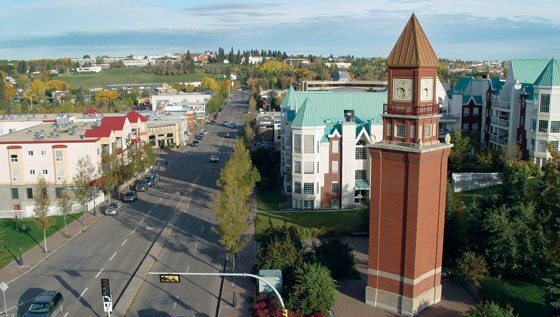 With a 2016 population of 34,066, Spruce Grove is the ninth-largest city in Alberta. The mayor of Spruce Grove is Stuart Houston. Spruce Grove is home to the Horizon Stage Performing Arts Centre, a local theatre, and the TransAlta Tri Leisure Centre, a recreation facility shared with Stony Plain and Parkland County. Jennifer Heil, the freestyle skier who won the first gold medal for Canada in the 2006 Winter Olympics games in Turin, Italy, and a silver medal at the 2010 Winter Olympics is from Spruce Grove, as is Carla MacLeod, a member of the 2010 Canada women's national ice hockey team. Stony Plain 135 is an Indian reserve in central Alberta, Canada in Division No. 11. It is located adjacent to Parkland County and the City of Edmonton, Alberta. It is home to the Enoch Cree Nation. The postal address of the reserve is Enoch, Alberta. Sundance Beach is a summer village in Alberta, Canada. It is located on the northern shore of Pigeon Lake. Mission Beach is a locality within the summer village. Thorsby is a town in central Alberta, Canada. It is located 38 km (24 mi) west of the City of Leduc, along Highway 39. Pigeon Lake and Pigeon Lake Provincial Park are located 20 km (12 mi) south of the community. Wabamun is a village in central Alberta located 67 kilometres (42 mi) west of Edmonton, Canada on Highway 16. Wabamun 133A is a First Nations reserve in central Alberta, Canada in Division No. 11. It is located adjacent to Parkland County on the east shore of Lake Wabamun and is home to the Paul First Nation. The Summer Village of Kapasiwin, the Wabamun 133B Indian reserve, and the Hamlet of Duffield are adjacent to Wabamun 133A to the northwest, north, and east respectively. Wabamun 133B is a First Nations reserve in central Alberta, Canada, in Division No. 11. It is located adjacent to Parkland County near the east shore of Lake Wabamun and is part of the Paul First Nation. The Summer Village of Kapasiwin and the Wabamun 133A Indian reserve are adjacent to Wabamun 133B to the west and south respectively. Warburg is a village in central Alberta, Canada. It is located 58 km west of the city of Leduc, along Highway 39. The village is named for Varberg Fortress in Sweden. The fortress's name was once spelled Warberg in English, but a spelling error resulted in the name Warburg.